An ecosystem is made up of the biotic (living) community and the abiotic (nonliving) factors that affect it. The health of an ecosystem is directly related to water quality. Abiotic factors determine ecosystem type and its distribution of plants and animals as well as the usage of land by people. Abiotic factors include water supply, topography, landforms, geology, soils, sunlight, and air quality/O2 availability. Human activities can alter abiotic components and thus accelerate or decelerate natural processes. For example, people can affect the rate of natural erosion. Plowing cropland can cause greater erosion, while planting trees can prevent it. Flood protection/wetland loss is another example. A watershed is the land that water flows across or through on its way to a stream, lake, wetland, or other body of water. Areas of higher elevations, such as ridgelines and divides, separate watersheds. 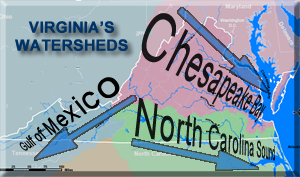 The three major regional watershed systems in Virginia lead to the Chesapeake Bay, the North Carolina sounds, or the Gulf of Mexico. 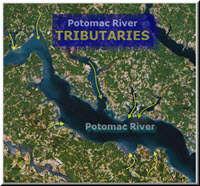 River systems are made up of tributaries of smaller streams that join along their courses. Rivers and streams generally have wide, flat, border areas, called flood plains, onto which water spills out at times of high flow. Rivers and streams carry and deposit sediment. As water flow decreases in speed, the size of the sediment it carries decreases. 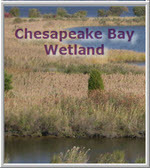 Wetlands form the transition zone between dry land and bodies of water such as rivers, lakes, or bays. They also provide food and shelter for wildlife and fish and nesting and resting areas for migratory birds. 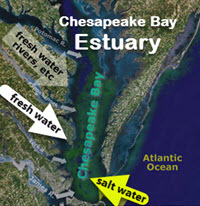 The Chesapeake Bay is an estuary where fresh and salt water meet and are mixed by tides. It is the largest estuary in the contiguous United States and one of the most productive. Water quality monitoring is the collection of water samples to analyze chemical and/or biological parameters. Simple parameters include pH, temperature, salinity, dissolved oxygen, turbidity, and the presence of macroinvertebrate organisms.